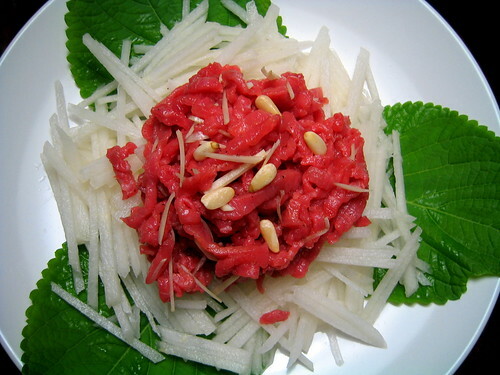 Yook hwe is basically a Korean steak tartar. It’s traditionally served with thin batons of asian pear, salt and sesame oil. Sometimes pinenuts or crushed pinenut to garnish. Make sure you have high quality meat (the cut is called beef eye round) and that your pear is super juicy, ripe and crunchy. At the Korean market they have prepackaged cuts of beef eye round labeled also in Korean as yook hwe. I started by prepping the pear. This pear cost $4.60! Seriously. Anyhow so I got that crazy pear, sliced it thin, then sliced it again lengthwise to get thin batons. You want about a two-to-one ratio of pear to meat. Then I cut the garlic into very very small strips. You want to cut it like this rather than mince it for the aesthetic value. Use a sharp knife though and mind your fingers. I wanted to freeze the meat a bit so that it would be easy to cut it into shreds but I didn’t have the time so I got going on it. I would recommend freezing it enough to facilitate the cutting if you’re going to give this dish a go. When you’re done with the meat add sesame oil, salt and black pepper to taste. Keep the meat cold in a chilled bowl and try to do this with some speed so your fingers don’t warm up the meat too much. Sesame oil is very strong so use a little bit at a time and keep tasting until it tastes good to you. The meat should have a glossy delicious looking layer of oil. Mine should have had a touch more sesame oil if you can tell from the pics. Now the plating.. carefully lay the pear on a plate and make a well in the middle. Place a mound of meat making sure garlic is distributed evenly and a few are at top to make it pretty. Then sprinkle the top with the pinenuts or crushed pinenut. You can just eat this simply with a chopstick or even better, on Korean perilla leaves. Man this was sooo good! I was just going to have a taste and take a picture but my mom insisted that we eat it. So we did and it was a happy time. The super juicy pear lived up to its crazy price and the meat was so fresh. I loved the nuttiness that the pinenuts added on top of the distinctly nutty sesame oil. And a bite of green from the perilla leaves added another layer of deliciousness. i don’t think that i have ever had yook hwe but it looks great! i love korean pears but it went up to $4 from $2? crazy! hannah, you is korean right? jk. 🙂 yeah those pears are crazy. my eyes nearly popped out of my head when the guy ringed it up. Wonderful colors. Did your mom teach you how to make it? Or did you just reverse-engineer it? hi ellen, i’ve had it bunch of times before out and of course at home too. i made the most classic and simple version though with my mom at my side to confirm the ingredients. the pinenuts was something new to me. loved it though. koreans love pinenuts, which i used to haaaate when i was lil. i love pinenuts in that one korean cinnamon drink! anyhow, yes i am korean (maybe not the most authentic :))…. i’m still reeling about how yummy my peas turned out. they were by far my best batch ever. mostly because i boiled the ham hocks for about two hours first, and then used that water to cook the peas and dumped the peas in. oh and i added stewed tomatoes, which i had never done before. i think the trick to my collards was washing each individual leaf with FIT vegetable wash. And then adding precooked ham hocks and the salt pork. and tomatoes. basically ham and tomatoes seem to be the key to soul food!! there’s nothing worse than gritty collards. yuck. first time reading your blog and like it lots! and yeah koreans love their meat and pine nuts. ive never seen raw meat look so good! Asian pears are crazy expensive. I miss my parents’ tree. I remember being ever so skeptical about eating raw beef until one day I had yook hwe at this one place in Korea. It also had a raw egg yolk on our dish. Basically everything was raw. Nevertheless, I was so blown away by its taste it’s still vivid in the back of my mind. By the way I never had a chance to try yook hwe again in the US. i used to skeptical of yook hwe when i was younger but now i love it! the pear and raw beef is a surprisingly good combination. Wow this is a some site you have here. You make everything! And it all looks tasty! You have any suggestions to where to get a good eye round in Ktown? Have you tried other cuts like sirloin, filet mignon, or even flank steak? I loved reading this! I am not Korean, but my boyfriend is from Seoul, Korea. I may have to come back to this website to find some inspiration for foods to cook him. Again really nice food!